Kyle Benedictus admitted Raith weren’t at their best at the weekend which made the point they took from the Fife derby all the more important. It’s the sign of a good team that, even when things aren’t going their way, they do enough to work together and at least grind something out of a fixture. And Raith had to do that at the weekend, Kevin Nisbet’s two penalties ensuring a share of the spoils against an East Fife side which felt it had done enough to win the match. The club skipper said: “Nobody likes to get beat so if you don’t get beat then you want to take a point. “Of course we want to win every game we can, but we know as footballers that it’s not like that. “It’s difficult to win every game and, as you can see after three league games, it’s tight, so you know what kind of league it’s going to be. Raith and East Fife went in at half time level, but it was the Methil men who appeared after the break with a spring in their step. Just like Nisbet, Scott Agnew bagged a brace for the visitors. But Raith need to be better than they were in the second 45, conceded Benedictus. “The second half we were disappointing,” he said. 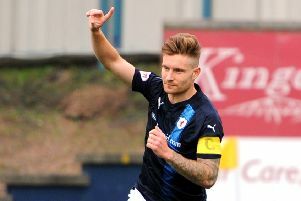 Raith’s home record last season was an impressive one, and the club captain knows that making Stark’s a difficult place to visit for opposing sides again this term will be crucial to their title ambitions. He added: “We only lost one game last year in the play-offs against Alloa and we need to do that again. “That’s a win and a draw from the first two games so you can look at it and say we’re still unbeaten. “But it’s important that our away form is better because I don’t think it was good enough last year. “We dropped a lot of points so if we can have the same home form as last season and pick up more points away then we’ll be alright.